Washington, D.C.—As President Obama unveiled his debt plan, which includes reduced spending for Medi­care and Medicaid by $580 billion, hundreds of activists with disabilities stormed the White House demanding a voice in Medicaid reform. 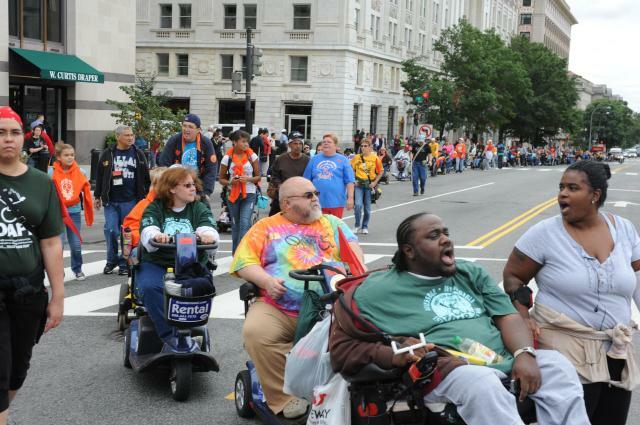 ADAPT, the national dis­ability rights direct action group, is asking the admin­istration to work with them to ensure that Medicaid dollars are invested in cost-saving community supports. Texas lawmakers underfunded Medicaid by about $5 billion, a move that homecare advocates say leaves the elderly and adults with disabilities unsure how their care at home will be provided. California eliminated funding for about 330 adult day centers, a move that will affect over 35,000 seniors who use them for medical care and socializing. Law­makers are hoping to restore about $85 million to tran­sition seniors into an as-yet-undetermined alternate program—about half the amount cut from the budget. Minnesota is considering cuts to home health aides and to a program that allows disabled people to live on their own. In Massachusetts, Governor Deval Patrick proposed cutting $55 million from the state’s adult daycare program, two-thirds of its funding, affect­ing some 5,200 participants. The ADAPT community has identified four princi­ples for real Medicaid reform: 1. Expand the use of com­munity-based services 2. De-medicalize services 3. Ex­pand consumer directed service options 4. Reorganize Medicaid services to eliminate wasteful bureaucracy. I applaud ADAPT’s efforts and agree that some­thing needs to be done immediately. However, reforms aren’t enough. Reforms are not going to result in the kind of lasting, continuous change that is needed; and it is unlikely they will take place under a system where healthcare is for profit. A capitalistic society that denies people a basic hu­man right like free healthcare will not willingly give up its power. ADAPT’s suggestions are based on human needs; to keep capitalism going, basic human needs come last, if at all. This entry was posted in Articles and tagged ADAPT, adult daycare, Barack Obama, Bruce Darling, capitalism, community-based services, consumer directed service options, De-medicalize services, Deval Patrick, disability rights direct action, Health care, healthcare, human needs, Human rights, Medicaid, Medicaid reform, medicare, Medicare Sustainable Growth Rate, Memphis ADAPT, people with disabilities, Randy Alexander, seniors, Suzanne Rose, White House. Bookmark the permalink.